Do you want a faster way to navigate the web? Then check out SiteLauncher for Chrome. It's free and awesome. The web is inundated with blogs aimed at startups and entrepreneurs, but which ones are worth your time? 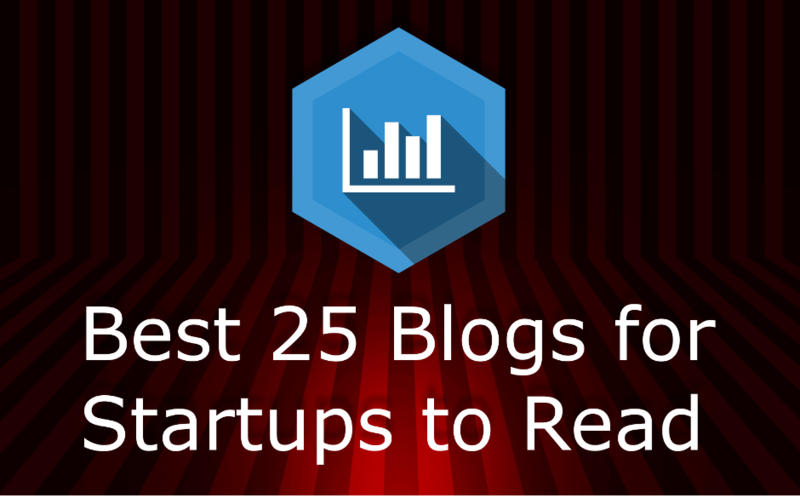 We review the best (in our humble opinion) blogs for startups. These are blogs that will give you valuable ideas and practical advice to help you boost your startup's success, as well as keep you up-to-date with vital industry trends. OnStartups is an India based blog by HubSpot founder Dharmesh Shah. Dharmesh is a successful entrepreneur and programmer. OnStartups is dedicated to delivering content for startups (especially tech startups) and the entrepreneurs behind them; the blog offers strong, practical and actionable advice. forEntrepreneurs is a blog by David Skok. David Skok is a successful entrepreneur - he has co-founded 5 companies three of which went public - and venture capitalist. 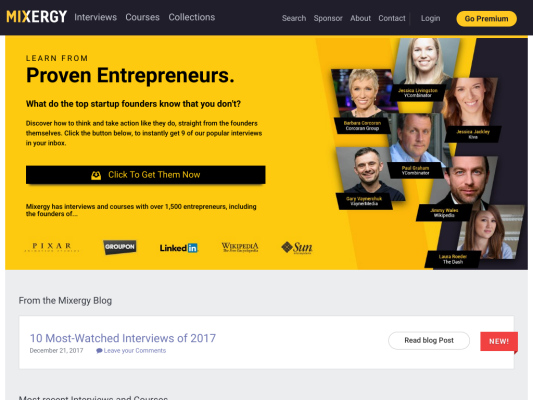 forEntrepreneurs was voted number 1 website for entrepreneurs by Inc. Magazine and number 2 by Forbes. The blog offers tons of practical and actionable advice with a particular focus on SaaS. 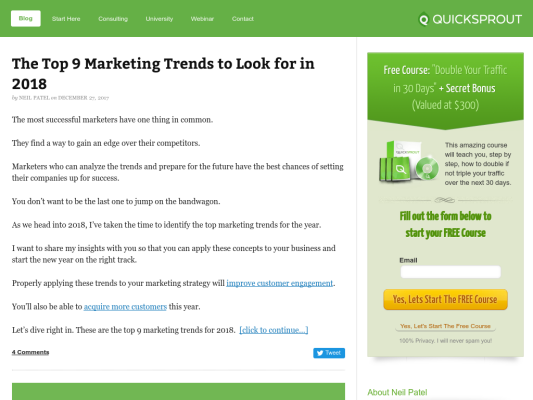 QuickSprout is a blog by Neil Patel, co-founder of Crazy Egg and KISSmetrics. Neil is a prolific blogger, and he has written for Forbes, Inc, Huffington Post and Entrepreneur. Neil consistently offers valuable and practical advice on online marketing, SEO, conversion tactics, traffic generation and social media. 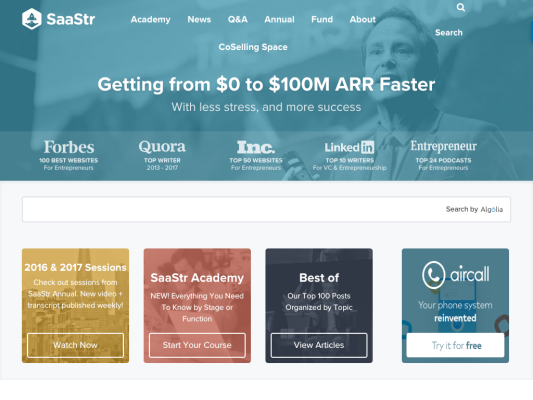 SaaStr is a popular blog - with over 3M unique visitors a month - by Danielle Morrill and Jason Lemkin created in 2012. Morrill is the co-founder SocialPandas and has been involved with numerous other startups; Lemkin is a venture capitalist and founder of two companies. SaaS stands for "software as a service" and the blog is dedicated to sharing practical advice on how to build and manage such services. TechCrunch is an extremely popular tech news website founded by Michael Arrington and Keith Teare in 2005. TechCrunch posts about the latest tech startups, mergers and acquisitions, the latest companies to get funding and articles on emerging trends. Essential reading to keep up to date with the industry. 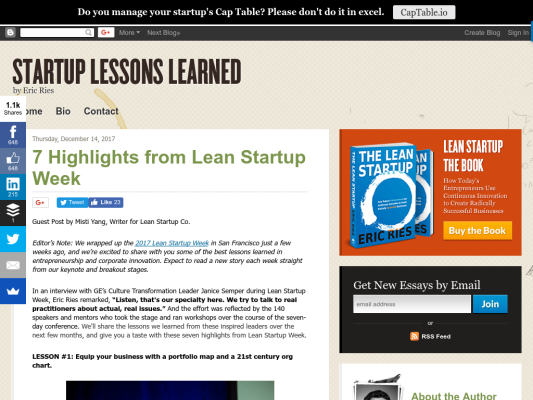 Startup Lessons Learned is a blog by Eric Ries. Eric Ries is an entrepreneur, programmer, writer and creator of the Lean Startup Methodology. Since retiring in 1998 Eric has become a successful venture capitalist. He shares his valuable lessons learned from his days in both successful and failed startups. Seth Godin is very popular, prolific and highly-acclaimed writer on the subject of marketing. On his blog he shares his excellent thoughts on marketing and entrepreneurship in a straight, to the point, succinct and often witty fashion. CopyBlogger is a hugely popular blog dedicated to teaching copywriting, founded by Brian Clark over 10 years ago. Brian has been involved in internet marketing since 1998. 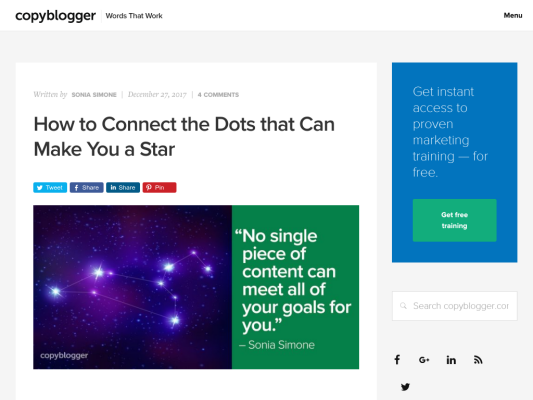 CopyBlogger is probably the most influential copywriting resource online, and with good reason, Brian and his team offer regular and consistently helpful and actionable advice on copywriting. 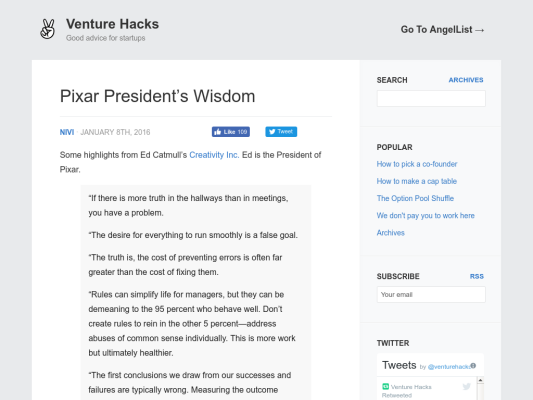 Venture Hacks is a blog by Babak Nivi and Naval Ravikant. Nivi and Ravikant are both co-founders of AngelList, Ravikant is also a co-founder of Epinions. Venture Hacks is a blog that offers "good advice for startups" in particular helpful advice on successfully getting funded. 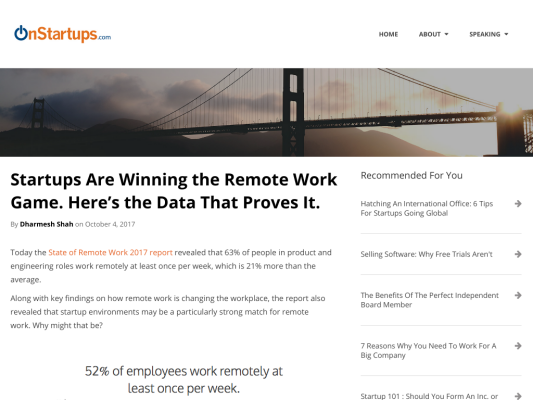 Tomasz Tunguz's blog is a favorite among the SaaS community. 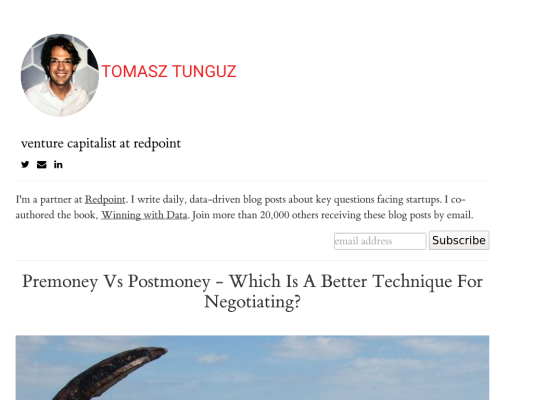 Tomasz Tunguz is a VC and a partner at Redpoint. Tomasz Tunguz's blog posts offer valuable advice - based on his many years of experience working with successful startups - on funding, management, team building and other challenges facing startups. Mixergy is a blog by Andrew Warner. Andrew Warner founded an online business with his brother that generated over $30M in sales. On his blog Andrew interviews successful startup owners and extracts solutions to common startup problem from them. 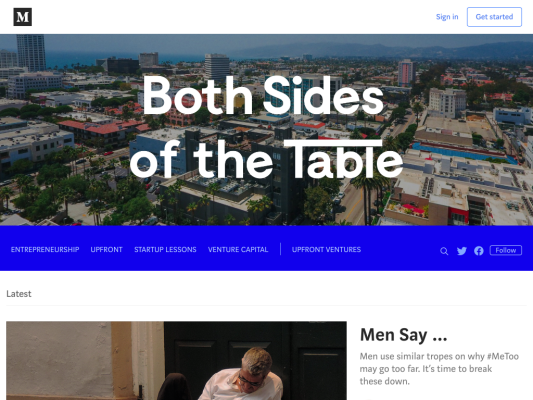 Both Sides of the Table is a blog by Mark Suster. Mark Suster is a serial entrepreneur, angel investor and General Partner at Upfront Ventures, his last company was sold to Salesforce. His blog is packed-full of analysis and valuable-insight on the latest trends and tech company news. The Next Web is one of the most well known blogs covering tech. The website receives over 10 million visitors per month and its stories often dominate social media shares. 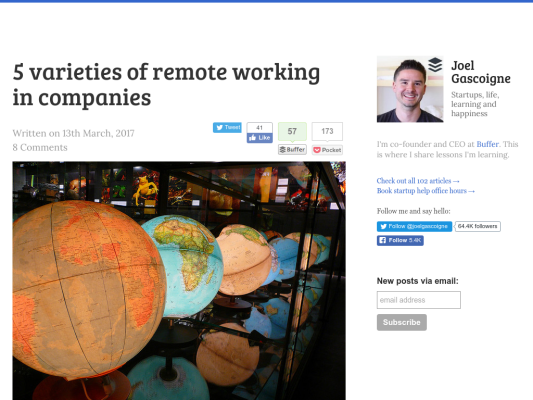 A must read for keeping up with technology news. ReadWrite (originally ReadWriteWeb) is a hugely popular web tech blog launched in 2003. ReadWrite offers informative tech news, reviews and analysis. Another must read for keeping up with technology news. 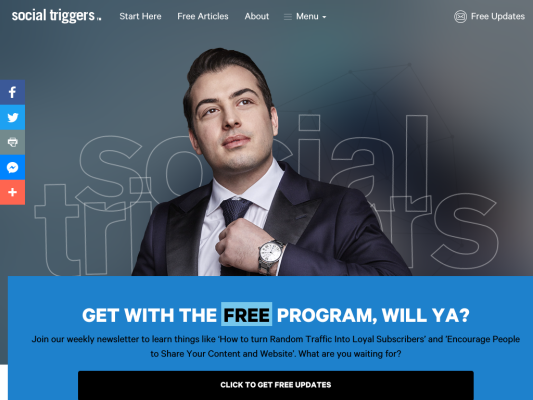 Social Triggers is a blog by Derek Halpern. Derek Halpern is a social media expert and critically-acclaimed writer. Derek's blog offers solid online-marketing strategies and tips for entrepreneurs. Founded by Peep Laja, ConversionXL is service which aims to increase website conversions. Peep Laja is a world renowned expert on website conversion with 15 years experience as a senior marketer and co-founder. 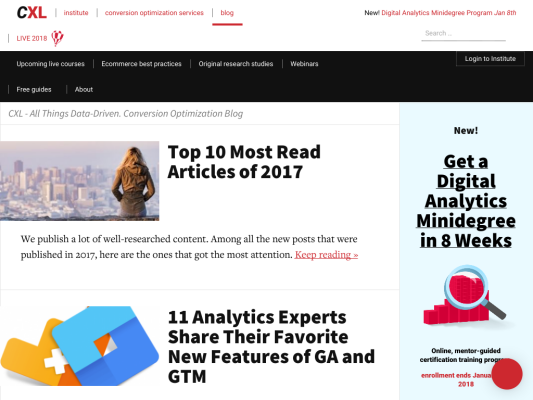 Peep Laja takes a science and data-driven based approach to offer extremely valuable insight on website conversion optimization. Steve Blank is a serial entrepreneur and author. His book "Four Steps to the Epiphany" led to the the Lean Startup movement. Steve has worked with 8 startups in his career, 4 of which went public. Steve offers valuable posts on tech, startups and business in general. 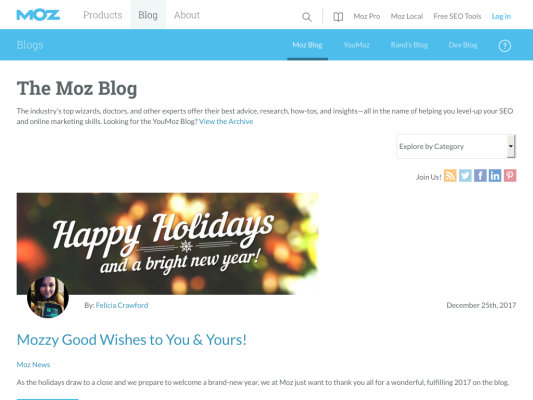 Moz is a widely acclaimed SEO firm founded by Rand Fishkin in 2004. The blog offers valuable advice on all things SEO from leading industry experts including Rand himself. Social Media Examiner is a blog purely dedicated social media marketing. The blog offers highly informative and timely articles on all things related to social media marketing from the basics to the advanced. Joel.is is a blog by Joel Gascoigne. Joel Gascoigne is the co-founder and CEO of hugely popular social sharing app Buffer. His blog offers valuable insight based on his own experience on how to build a strong startup. 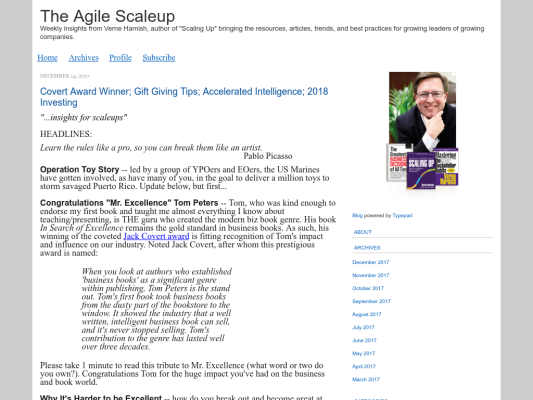 The Growth Guy is a blog about how to grow companies by Verne Harnish. Verne Harnish is a prolific author described as one of the "Top 10 Minds in Small Business" by Fortune. His blog contains weekly insights on small business trends and solid actionable advice on growing companies. Andrew Chen's blog is entrepreneurship blog. 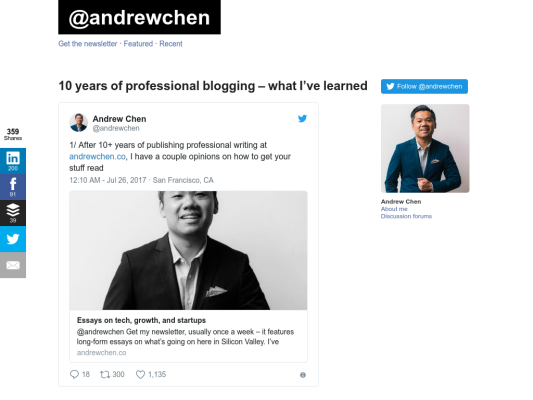 The author of "The Lean Startup," Eric Ries described Andrew's blog as "one of the best entrepreneurship blogs of all time." Andrew works for Uber on their growth team, he also an advisor for a number of successful startups. Andrew has been quoted by The New York Times, Fortune, Wired, and WSJ. Read his blog for top advice on entrepreneurship, tech, mobile, metrics and growth. Sixteen Ventures is a blog by Lincoln Murphy. Lincoln is a customer success and customer acquisition expert who has worked with over 300 SaaS companies to help them accelerate growth. Lincoln has been featured in Inc Magazine, Fast Company and Venture Hacks. 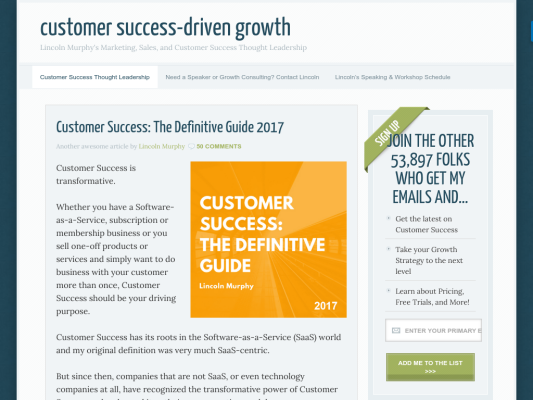 His blog offers valuable and practical advice on customer success, acquisition and retention. 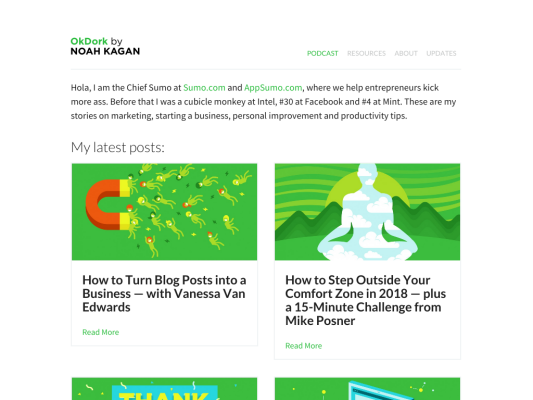 OkDork is a blog by Noah Kagan. Noah Kagan was an early Facebook employee and is co-founder of Appsumo and Sumome. On his blog Noah writes "You'll learn exactly how I started 2 multi-million dollar businesses, grew a 700,000+ email list, and where to find the best tacos in the world." Noah and his guest bloggers offer valuable and practical advice on marketing and growth. 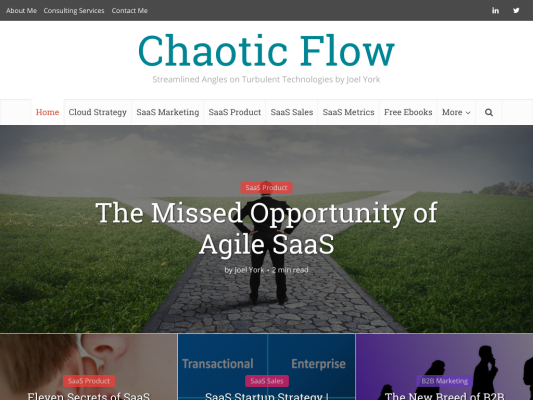 Chaotic Flow is a blog by Joel York. Joel has over 20 years experience making and marketing B2B software for a number of different industries. On his blog Joel shares insightful and valuable advice on models, metrics and improving SaaS sales.